Kwasi Enin, Long Island high school student, who has been accepted to all 8 Ivy League schools. 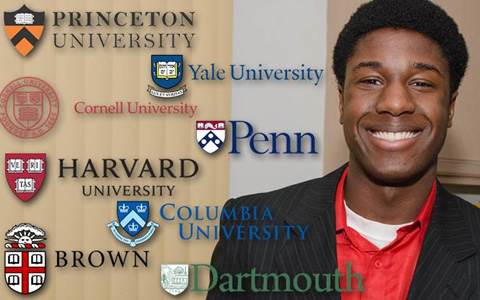 Kwasi Enin, the son of Ghanaian parents, was recently accepted to all eight of the Ivy League schools! Enin, a student of William Floyd High School in Long Island, received acceptance letters to the following Ivy League colleges and universities: Harvard, Yale, Princeton, Brown, Columbia, Cornell, Dartmouth and the University of Pennsylvania. It is a remarkable feat and Kwasi Enin was surprised when he continued to receive acceptance letters. He’s still deciding but Yale and Harvard are on the top of his list. Several times a week, there are many stories out about teens causing problems with flash mobs, fighting and inappropriate social media behavior. It is refreshing to hear a story about teens doing positive things in their schools and communities. Congrats to Kwasi Enin! I hope his story will help encourage media to highlight teens that are doing big things and representin’ other teens well. Read more about Kwasi Enin in the New York Daily News. Uplifting the esteem of girls with fun, fashion and style.